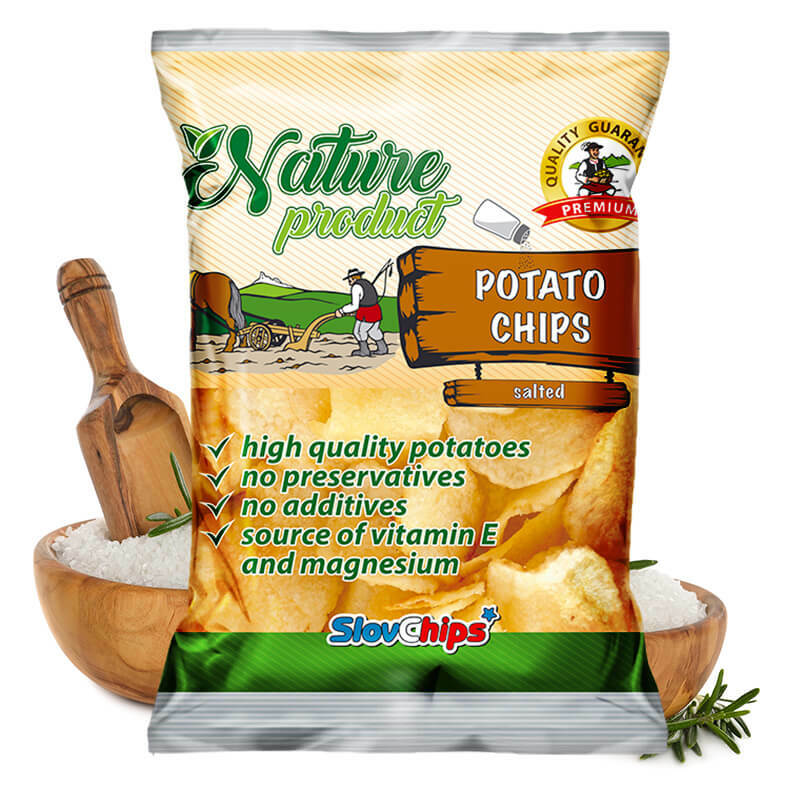 Potato chips with no preservatives and no chemical additives. Our Farmer’s potato chips bring to you the true regional flavours. Lightly salted Farmer’s pretzel sticks are irresistible. Perfect for any occasion. 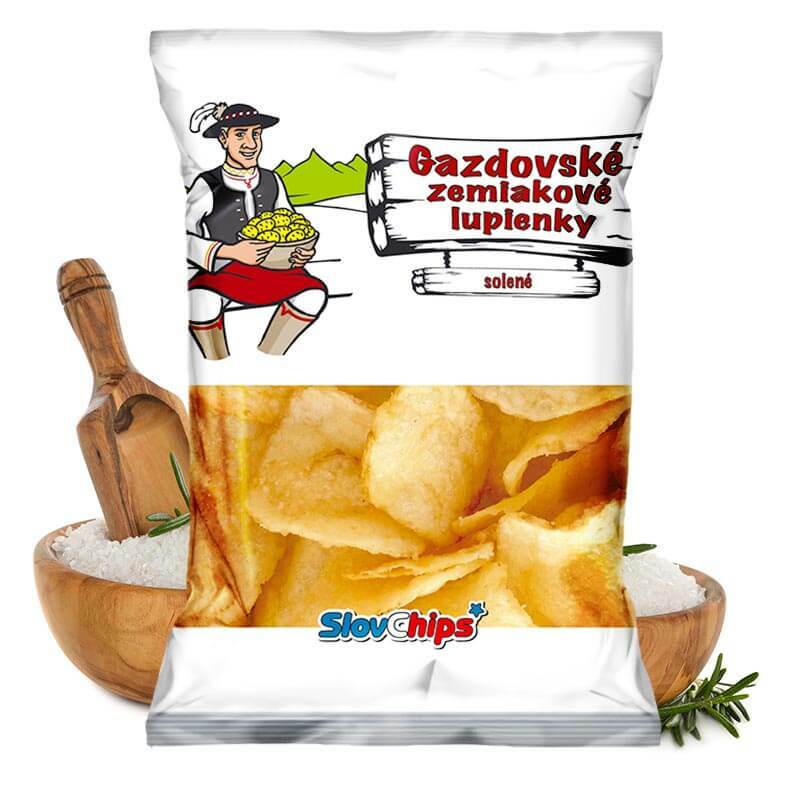 We produce the potato chips without precooking potatoes, allowing our chips to keep their nutrients and their traditional taste. When choosing our flavourings and ingredients, we make sure they are produced on a natural basis and from only high-quality ingredients, guaranteeing product’s premium quality. 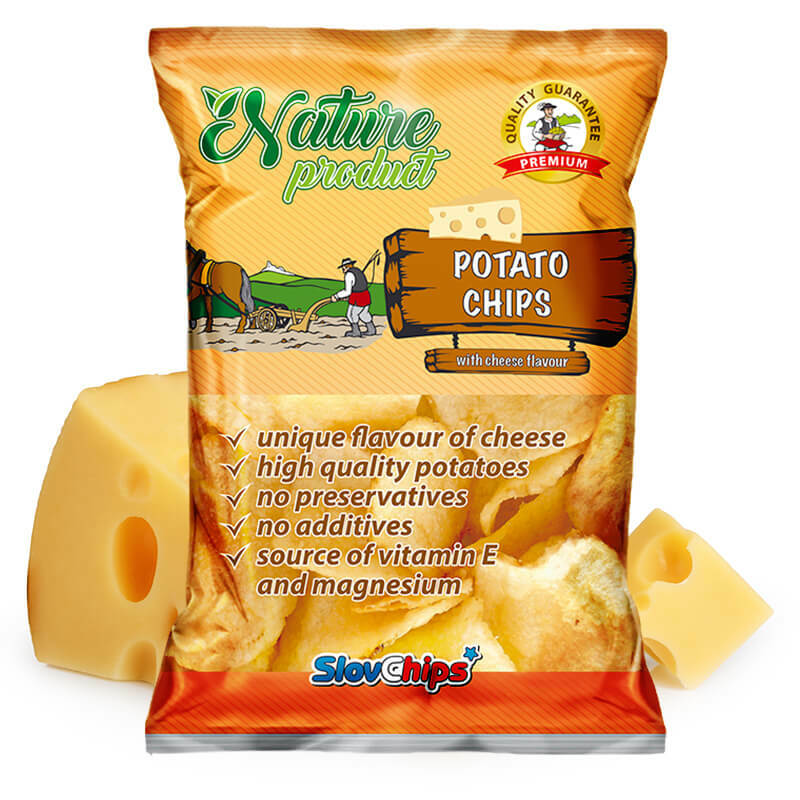 The Nature product potato chips are available in three flavours – salted, a flavour of boletus and a flavour of cheese. Classic salted flavour, but preservatives and additives free. Not only that – these chips are rich in Vitamin E and magnesium. Potatoes 63,5%, vegetable oils (rapeseed, sunflower), salt max 2,5%. It may contain milk. These are not like the cheese-flavoured potato chips you’ve had before. Flavoured with real cheese powder, their taste is just so rich and unique! Of course, they are preservatives and additives free and rich in Vitamin E and magnesium. Potatoes 58%, vegetable oils (rapeseed, sunflower), flavouring max. 6% (maltodextrin, salt, cheese powder, sugar, aroma, coconut oil). 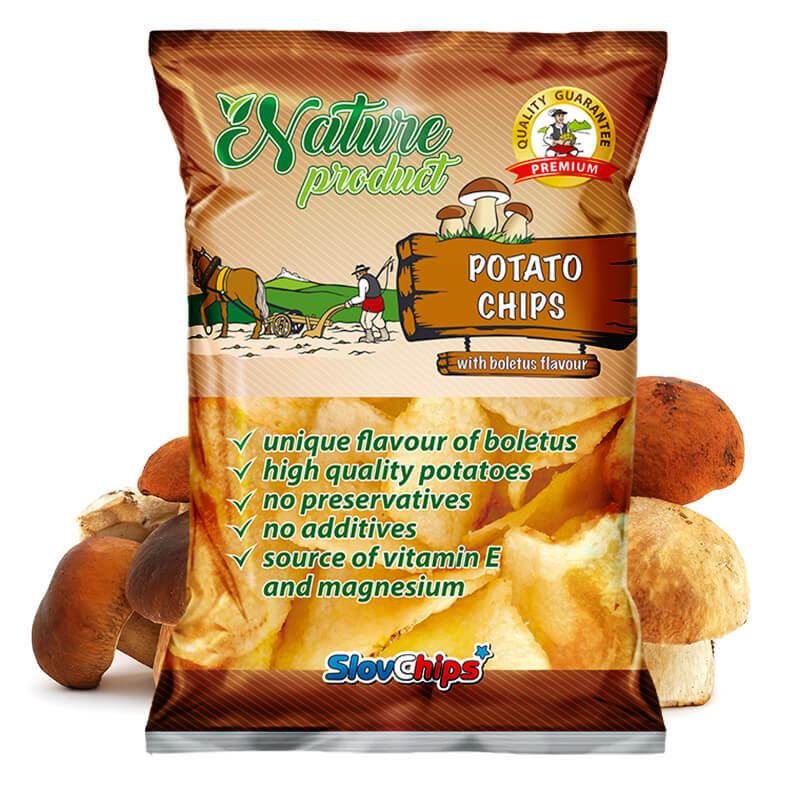 Preservatives and additives free potato chips with a unique flavour of boletus. All ingredients are natural and high-quality, and so is the taste. Rich in Vitamin E and magnesium. Potatoes 55%, vegetable oils (rapeseed, sunflower), flavouring max. 6% (maltodextrin, salt, corn starch, aroma, yeast extract, dried milk, dextrose, garlic powder, sugar, onion powder, boletus powder, coconut oil). Farmer’s potato chips bring to you the true regional flavours. 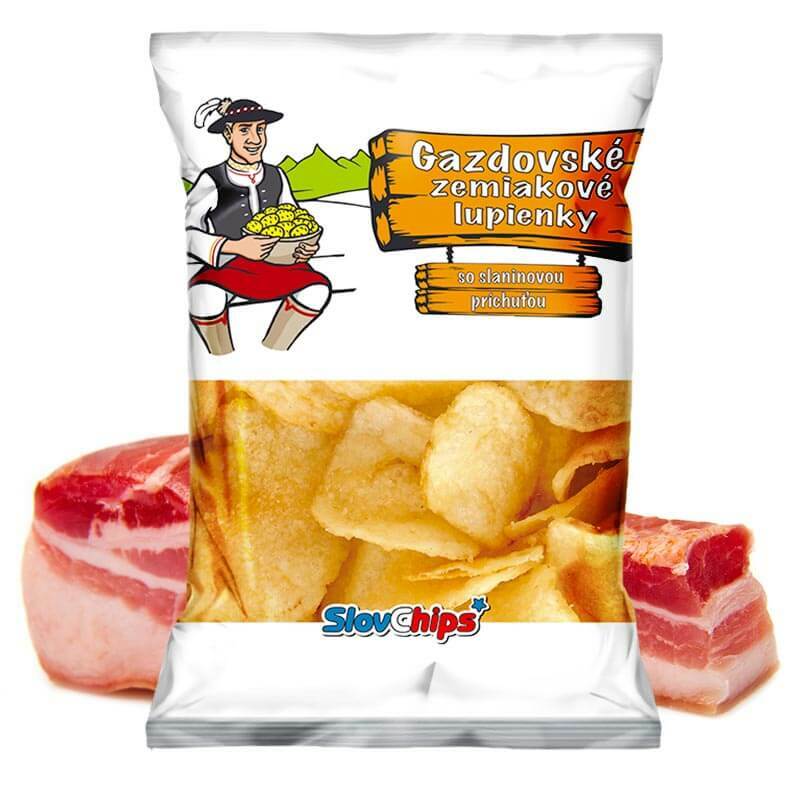 They come in traditional salted flavour and a flavour of bacon, but also three specialties – flavours of mustard, garlic and a flavour of extra spicy paprika. Package of the Farmer’s potato chips can be produced in a language of your choice to best fit your market. 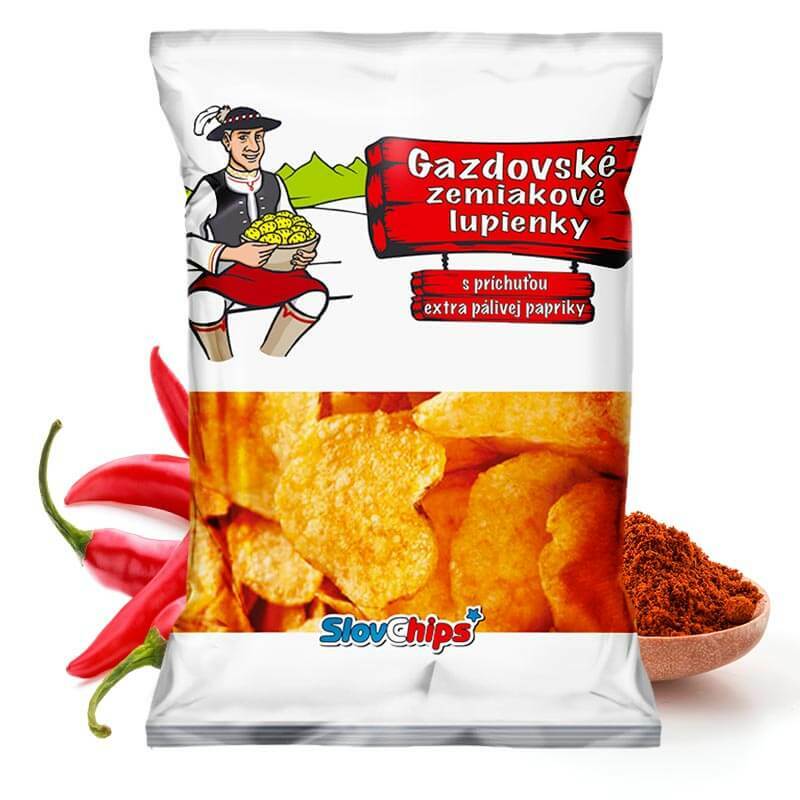 Farmer’s potato chips with a flavour of extra spicy paprika will truly create fire in your mouth, but rich-tasting paprika will leave an unforgettable taste. Potatoes 60%, vegetable oils (rapeseed, sunflower), flavouring max. 6% [sugar, salt, maltodextrin, flavour enhancer: sodium glutamate, grinded sweet paprika, grinded fried onion, grinded onion powder, grinded garlic powder, colouring: capsanthin, grinded extra spicy paprika, acidity regulator: citric acid, aroma (contains celery)]. It may contain milk. Unique and irreplaceable taste of mustard will literally attract you. Excellent with beer and wine. Potatoes 61%, vegetable oils (rapeseed, sunflower), flavouring max. 6% (glucose syrup, salt, maltodextrin, flavour enhancer: E621, acidity regulator: citric acid, flavour enhancer: E635, hydrolysed soy proteins). It may contain milk. Another of our regional specialties. The taste of these chips is so well balanced and the taste of garlic so rich. Potatoes 62%, vegetable oils (rapeseed, sunflower), flavouring max. 6% [dried vegetable (garlic, parsley), salt, aroma (contains fish), spice extracts, flavour enhancers: E621, E635]. It may contain milk. Traditional taste of bacon, a real classic when it comes to farmers. potatoes 61%, vegetable oils (rapeseed, sunflower), flavouring max.6% (glucose syrup, salt, colouring: paprika extract, flavour enhancers: E621, E635, aroma, anti-caking agent: silicon oxide, spice extracts). It may contain milk. 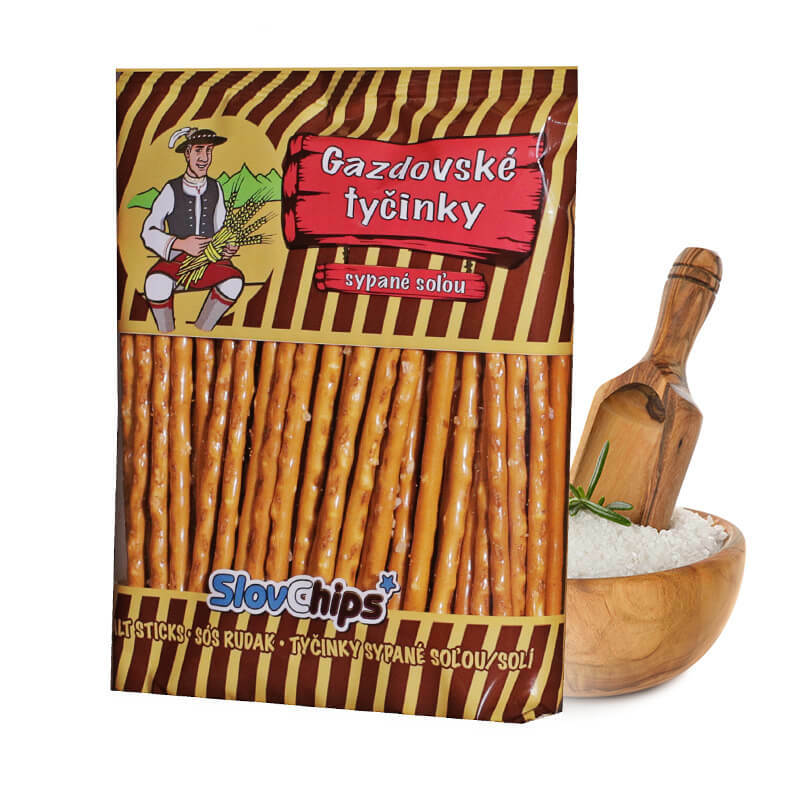 Lightly salted Farmer’s pretzel sticks are just irresistible. 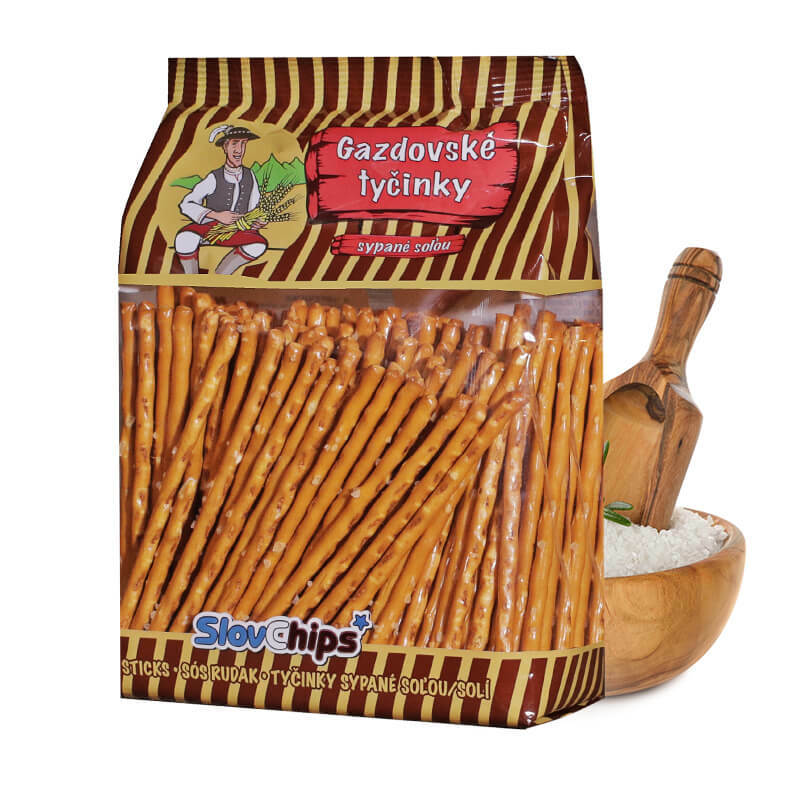 Lightly salted Farmer’s pretzel sticks are just irresistible. Perfect for any occasion. wheat flour, water, vegetable rapeseed oil, liquid syrup mixture (glucose–fructose syrup, sugar, water, colouring: E150c, aroma, acidity regulator: citric acid), salt (3,2%), sugar, dried milk, raising agents: sodium carbonates, ammonium carbonates, vanilla sugar (sugar, aroma: ethylvanillin), aroma. It may contain eggs, soy, sesame seeds. Bigger package for sharing, or for bigger pretzel sticks lovers. Donec nec justo eget felis facilisis fermentum. Aliquam porttitor mauris sit amet.